Micro cache near Southern Light Community Church. Originally known as The Zion Chapel, this Assemblies of God Pentecostal church was renamed Southern Light Community Church in 1997. 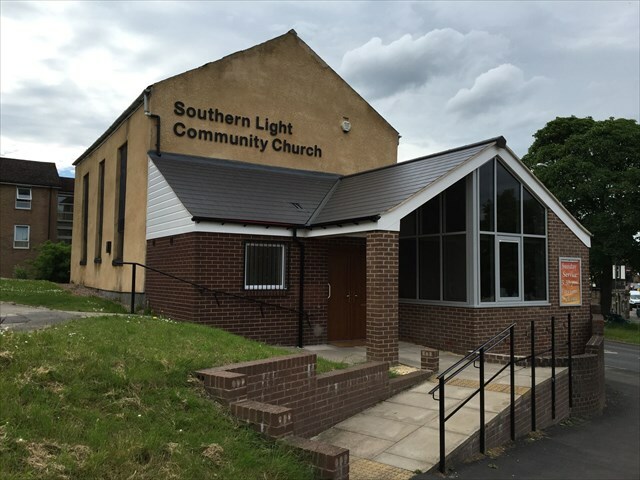 The building has recently had an extension, including a community café. The cache is not on the church grounds but a short walk away. To find the coordinates, answer the questions below. The information can be found on a notice board. There is a car park next to the church, however it is often full, depending on the day and time. Also, towards the bottom, there is a 'residents only' sign. A larger car park is a short walk away (see waypoint), which is especially useful to do the Woodhouse church micro series.